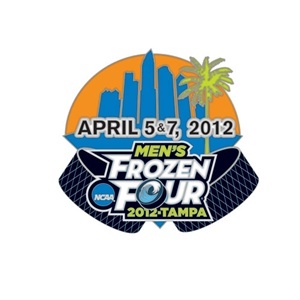 You probably haven’t heard, but the NCAA hockey version of March Madness began its Frozen Four today down in Tampa, Florida. Ever since the 16 team bracket became official during the March 18th selection show, college hockey teams from all over the northern half of this fine country have thought about this moment and being one of the four final teams remaining in the quest to win a Division 1 Championship. Not surprisingly all four of the teams who played at the Tampa Bay Times Forum today were ranked in the top ten nationally in the most recent rankings: #1 Boston College, #3 Union College, #6 Minnesota, and #9 Ferris State. Union College met Ferris State in the early game today (which was televised by ESPNU at 4:30 PM, showing you the mass appeal of the game) and Boston College and Minnesota matched up this evening beginning at 8 PM on ESPN2. 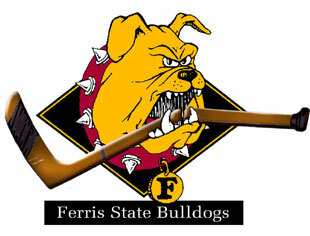 I really enjoy the Ferris State Bulldog hockey logo. Union College is a tiny liberal arts college (2,1333 student enrollment) located in Schenectady, New York, that doesn’t even offer athletic scholarships. It is pretty impressive that would make it all the way to college hockey’s biggest stage. Their opponents, the Ferris State Bulldogs, hail from the ninth largest university in Michigan at 14,560 students and at one point this season were ranked #1 for a two-week stretch. Both teams were making their first ever appearance at the Frozen Four, so you can only imagine how happy the athletes, coaches and administrators were to make the trip down to Florida and play in front of a national audience. This game went down to the final period tied 1-1, until Kyle Bonis snapped the tie at the 15:17 mark of the third on a rebound deflected away by Union goaltender Troy Groesnick. Aaron Schmidt added his second tally of the game into an empty net in the final minutes, and Ferris State advanced 3-1 for the chance to play for their first championship. Parker Milner has been unbelievable so far this season: 27-5-0 with a 1.70 goals-against average and .935 save percentage going into tonight's contest. The second game of the Frozen Four matched up two teams who had been there before and are a little bit more recognizable to the casual fan. The Eagles of Boston College are making their 23rd appearance in the Frozen Four and are gunning for their 5th National Championship, while the Gophers of Minnesota made their 20th Frozen Four appearance and have 5 National Championships to their credit. This was a game that should have been a classic matchup, but the Eagles were having none of that, and really took control of this game in the second period. Through the first period, on the scoreboard Boston College held a 1-0 lead on a goal by Steven Whitney, but they were honestly outplayed by the Golden Gophers. 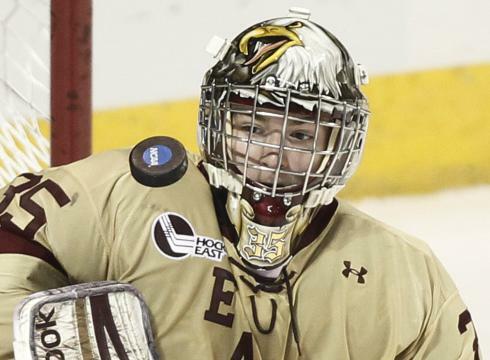 If it weren’t for a few incredible saves by Eagles netminder Parker Milner the Gophers could have easily held a 3-1 lead after the first period but it was not to be for the boys from Minnesota tonight. In the second period Kevin Hayes added a tally to make it 2-0 Eagles, and then with less than 3 minutes left before the second intermission BC added two more goals, one from Chris Kreider and the other from Paul Carey, and momentum had swung. Early in the third period senior Jake Hansen for Minnesota scored the first and only Gopher goal, but that was quickly answered by Carey twenty two seconds later to make it 5-1. Brian Dumoulin added one final insurance goal at the 5:51 mark of the third period and the Eagles coasted to the victory. On Saturday night the top ranked Eagles will now face the Ferris State Bulldogs for a National Championship. Boston College will be a heavy favorite in that game and I would be very surprised if they aren’t flying back to Boston champions. The great thing about sports is that anything can happen on any given night, the Bulldogs are going to give the Eagles their best shot, and sometimes crazy things happen. It should be an exciting game either way. Here’s to hoping that more than just family, friends, and alumni of these two schools will be watching! This entry was posted in Hockey and tagged Boston College, Ferris State, Frozen Four, Hockey, Minnesota, NCAA, Tampa, Union College. Bookmark the permalink.